Happy Sunday! I hope you guys made it through the busiest shopping weekend of 2014! Oh, what’s that? You want to shop more? Sure! My Slink Obsession ends tomorrow, so hurry hurry down to shop! I’m wearing the Ribbed Knit Sweater by Stellar that you can find at MSO. I’m wearing it on the Slink Physique body, but if you want it and don’t have the Physique, there are layers to wear on just your regular avatar body. Level Up is open and it’s all about retro games this month! I’m wearing the Gravity necklace by Cae for the event. It looks like old school Tetris! How cute! Truth just released some new hair for us, and yay for hat hair! Aspen looks like your hair is blowing a bit in the breeze and the hat is texture change through the hair color HUD. If you are part of the Truth subscriber, Aspen is also a gift in a few colors! You can join the group and still get it. Just click on the Join Group button on his subscriber, then click Join Group again to access the menu and have it delivered. There are a lot of people clicking and clicking on the thing, though, so it might not come to you immediately. So Ms. Elle Kirshner of Second Spaces has been an incredibly busy bee lately! Let’s take a look at a couple of her new releases! Collabor88 starts today and for this photo, I’m using a few pieces from the new Snow Day set by Second Spaces. I LOVE this set! There are several pieces because Elle is truly the queen of stuff to clutter your home up with. The lights on my wall are from the set, but I edited them to be bigger and tinted the bulbs red. Go on! It’s time to shop! I’m still having fun with my Arcade goodies! My MishMish Hammies and I did a little baking today. And even though I said I wouldn’t change out of the sweater I was wearing yesterday, Coldlogic released and well…how can I resist?? Coldlogic released some sweater and skirt outfits today and they’re totally cute! I’m wearing the Love outfit and it’s just cute cute cute! They are separates, so you can wear the sweaters and skirts with other tops and bottoms. Pretty much every Arcade, I have to collect the whole set of whatever MishMish puts out and so it was again with the Baking With Hammies set. The MishMish items are usually retired after that round of The Arcade and not sold again, so it’s worth collecting the whole set! Look at their little faces! They are the best kitchen helpers ever! I got my cookie tray and the oven mitts from that set, too. Hey! Did you know The Arcade opened?? My family loves to hit it up the first couple of days because we like to sell things at our yard sale [sorry, shameless plug], but also because we just LIKE STUFF! This round is my first time really getting to play in forever because before, I couldn’t see anything since my computer was so old. My husband is AWESOME, though, and he got me a LOT of things! Like my Erratic sweater that I thought I’d NEVER get! I woke up this morning so happy! I don’t think I can ever take the Hazel Oversized sweater off, however, because it’s GOT to be the most dang expensive sweater that I own now! But I also got a lot of socks! I love the Eva holiday socks, also from Erratic, because they are just sooo pretty and fit SO well! But can someone tell me what boots work with these socks, please?! 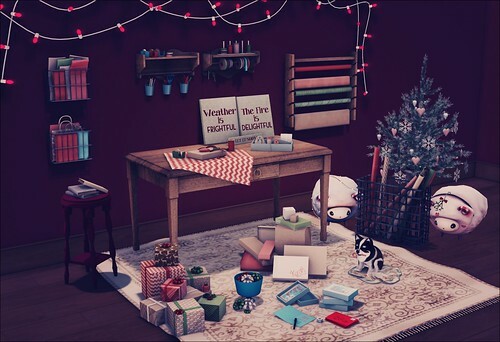 If you haven’t spent all your money on gacha, don’t forget that FaMESHed is open, too! 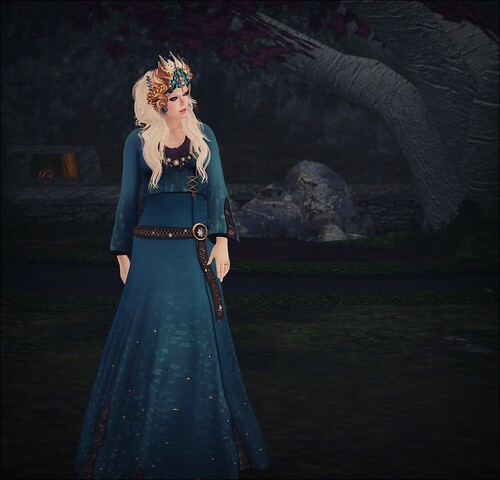 I’m wearing the Holly hair from Wasabi Pills because I couldn’t resist it. Not only is it cute, but it’s got the same name as my RL kitty!